The Hadrian’s Wall landscape is a great focus for heritage conservation, scholarly research and tourism, but primarily it is a landscape of people... past, present, and future. To promote the recreational value of the National Trail and the wider World Heritage Site in a way that is archaeologically, environmentally and economically sustainable. To promote a forum for visitors and locals alike, indeed anyone with an interest in the Trail and associated access, to contribute ideas and enthusiasm towards the long-term well being of both the World Heritage Site and access within it. To support efforts aimed at securing proper resourcing for the management and maintenance of Hadrian’s Wall Path and associated access routes. To lobby any sector – national/local government, business/organisation or individual in order to achieve our aims. To promote and support best practice management and maintenance of the Hadrian’s Wall Frontiers of the Empire World Heritage Site and Hadrian’s Wall Path National Trail for public enjoyment in a way that is environmentally, archaeologically, economically and socially sustainable. To offer a conduit for ideas and concerns to enhance public enjoyment of the Hadrian’s Wall Frontiers of the Empire World Heritage Site and Hadrian’s Wall Path National Trail. WALLTOGETHER is an independent organisation established to expand and strengthen grass roots communication along the Hadrian’s Wall World Heritage Site corridor, defining and building a Wall-wide community of interest and influence. We are keen to hear from those who have a point of view ie. 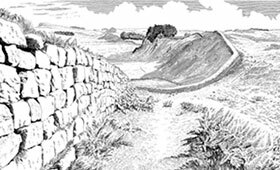 any individual, community, organisation, or business wishing to contribute by highlighting pertinent issues relating to Hadrian’s Wall or its landscape setting. At its heart WALLTOGETHER has the best interests of the monument and the communities through which it runs. Hence it is an open door providing a forum for ideas and debate. Importantly WALLTOGETHER will develop the role of critical friend in an attempt to bring stability and greater understanding in matters relating to conservation, sustainable tourism, agricultural practices and community life. WALLTOGETHER invites anyone with a passion for this remarkable landscape, who has creative ideas, or simply wishes to learn more about the Wall, to get in touch and be involved.